Kew Gardens topped a list of neighborhoods with the worst streets in the city, a report released Tuesday by the city Independent Budget Office claims. 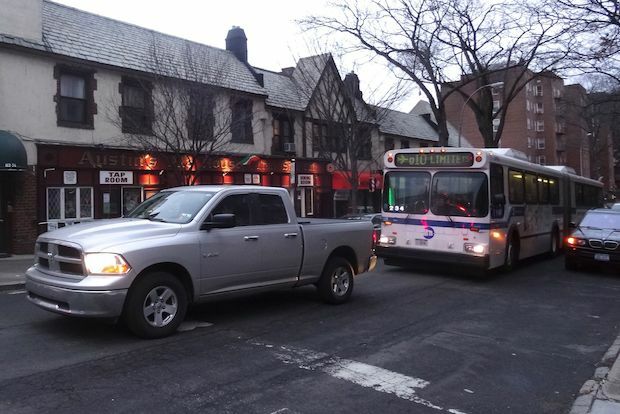 QUEENS — Kew Gardens has the worst streets in the city, according to a study carried out by the Independent Budget Office. The report found that only 28 percent of the neighborhood's streets were classified as being in “good" condition, placing it at the very bottom of the list that includes 188 city areas. The findings are based on Department of Transportation information gathered in 2014 and 2015. About 66 percent of Kew Gardens' roads were listed as being in “fair” condition and more than 5 percent were in “poor” condition, according to the report. But the DOT said that since July 2015 the city has repaved more than 46 miles of lanes in Community Board 9, which covers Kew Gardens, including at Austin, Brevoort and Grenfell streets, Curzon, Cuthbert and Abingdon roads, Mowbray Drive and Lefferts Boulevard between Kew Gardens Road and Metropolitan Avenue. Locals agreed that streets in their neighborhood have gotten better in recent months. “A lot has changed since then and many streets have been improved,” said local resident and activist Carol Berger. The report also listed Parkchester in The Bronx, Seagate and Coney Island in Brooklyn, Stapleton and Rosebank in Staten Island and Carnegie Hill in Manhattan among neighborhoods with the poorest street conditions. The three with the best roads were in Brooklyn — Fort Greene, Starrett City and Williamsburg, according to the report. The best roads in Queens were in Laurelton, where nearly 85 percent of streets were listed as being in "good" condition. According to the DOT, a road is considered in “poor” condition if more that half of it contains "distressed areas" such as cracks, patching and surface peeling. The city repaved or resurfaced 1,325 miles of lanes last year, including approximately 391 in Queens, the agency said.